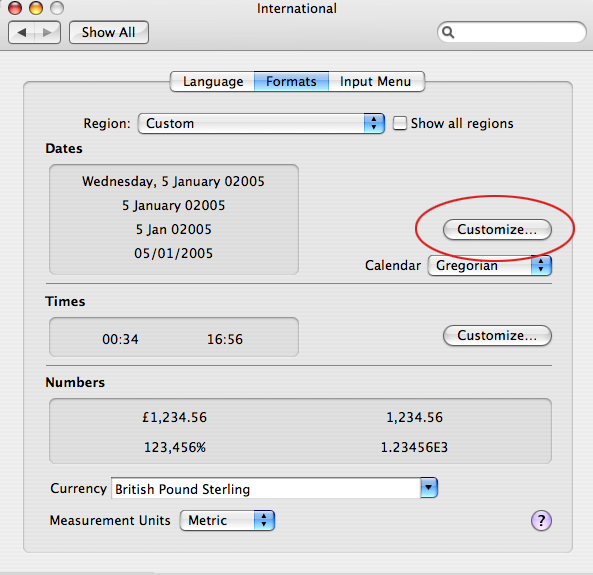 If you like Stewart Brand's/Daniel Hillis' "long now" idea of promoting long term thinking, here are some instructions how to teach your Mac running under OS X Tiger to display the system time (e.g. in Mail) with a Zero at the front, as in 02005 instead of only 2005. 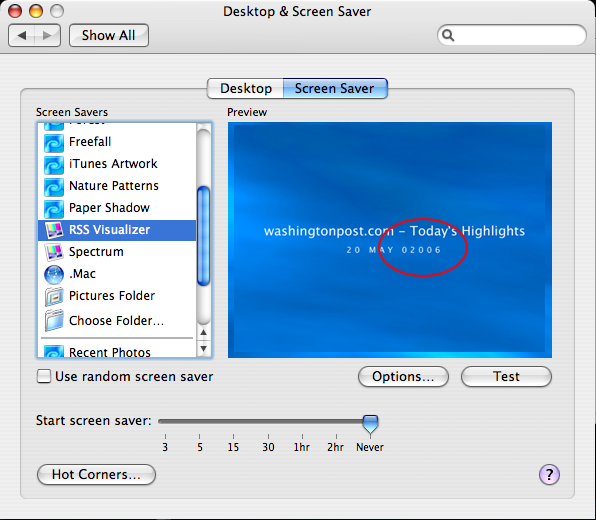 I don't really use screen saver, but the RSS Visualiser with the washingtonpost is excellent. And it displays longnow time! 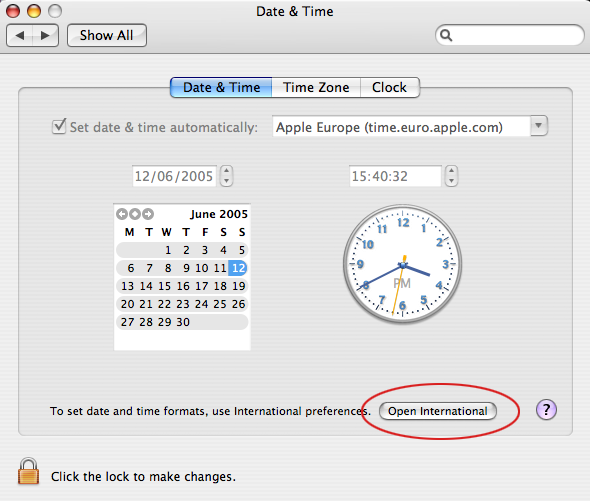 Open System Preferences and "Date & Time." Go to "open international." Don't edit "Short"! 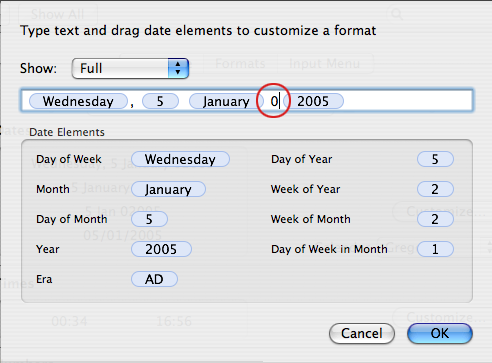 Now it needs a bit of tweaking: You can type in a ' 0' (space 0) before 2005 in the "Medium", "Long" and "Full" view, BUT on my machine i cannot change the "Short" setting. If i do so, "Medium", "Long" and "Full" snap back to their original view. 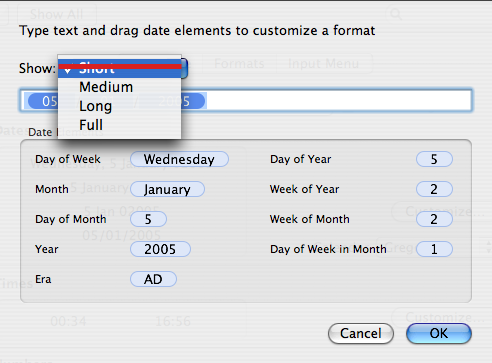 So start with the 'Full" and type in " 0" (Space0). Continue with "Medium" and "Long". If you try to alter "Short" you will have to start over again. Select OK, and that's it. Welcome to 02005. As you can see by adding the Zero you just change the time display - not system time as such. Perhaps the next Mac OS will. It also affects only some applications and not all. Calendar stays as it is. or take a look at my flickr images of the model clock at the Science Museum in Londinium: http://www.flickr.com/photos/hohlwelt/1641884/ Brian Campen also added the link to an interview about the project with Brian Eno. 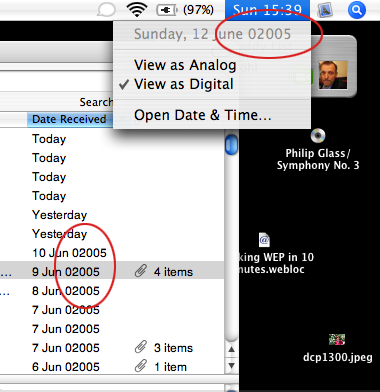 I also just got a wonderful gift from LS, Brian Eno's CD "January 07003 | Bell Studies for The Clock of The Long Now." It contains 15 long & short tracks with studies of different bells, from "Deep Glass bells," to "German-style ringing" and "Changes for January 07003, soft bells, Hillis algorithm." I guess all of them are achieved via special software applications that are capable of "physical modelling," creating sounds from simulated "real" physical properties - otherwise the giant "Kolokol" bell woudn't have been able to sound ... The result is beautiful to listen to and meditative as the bell sounds mingle with the background. It has been an utter joy listening to it over the Easter break on a Greek island where the sounds mingled with the continuous local Easter bell ringing, 02007 mixing with 07003. The CD comes with a little booklet containing two texts "Bells and their history" and "The Long Now Foundation," both interesting texts about the two projects in detail, especially helpful Brian Eno's research into bells.